C.S. Friedman has garnered praise for the powerful writing and vivid world-building in her dark fantasy novels for adults. Her novel,This Alien Shore was named a New York Times Notable Book of the Year, and her Coldfire and Magistrate trilogies are considered classics of the genre. 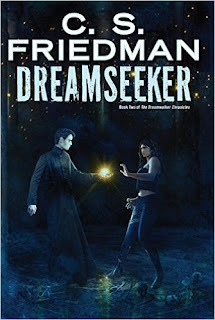 Last year, with Dreamwalker (DAW; February 2014), Friedman ventured into young adult for the first time, launching an all-new thrilling series. Imaginative and action-packed, it was the beginning of a stunning adventure into a visionary new universe that left readers of all ages breathless. In Dreamwalker, Jessica discovered that she can not only affect the dreams of others, but also travel across worlds and dimensions. Through her travels, she met kindred spirits who possess her same mysterious gift—the gift of the Dreamwalker. Now she returns to the scene with DREAMSEEKER (DAW Hardcover; $19.95; November 3, 2015), continuing Jessica’s adventures as she learns deeper, darker, and more dangerous secrets. The series features fan-favorites like young hacker geniuses, elegant magic systems, and portal fantasies and is sure to be a hit with fans of Brandon Sanderson, Cassandra Clare, and Libba Bray. 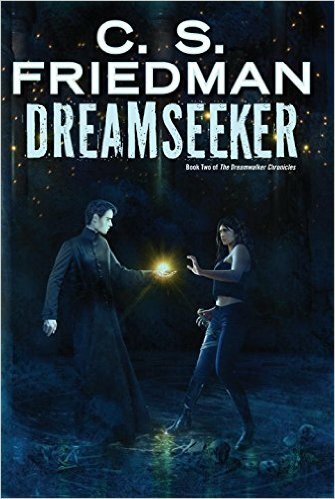 Many know Friedman for her Coldfire trilogy, but Dreamwalker and Dreamseeker are quickly becoming as popular. A huge departure from what we're used to, Dreamwalker sent us diving into the science fiction world of Jessica Drake. Jessica finds out that she was switched at birth. Suddenly, Jessica is sent into an amazingly descriptive science fiction world where she must learn who she really is. Jessica's loyalty her family is her most redeeming quality, and she's a good character overall. Being an open-ended series, this opener sets up the sequel well. Coming out on November 3rd, Dreamwalker's sequel Dreamseeker takes us deeper into Jessica's dreamwalking ability as she meets more people like her and learns how to develop her gift. Having been away from home for so long in book one, Jessica is now able to leave the science-fiction world behind, but not completely and not without danger. Now someone is stalking Jessica in her dreams, and an entirely new adventure is about to begin. In the world where she is awake, Jessica feels completely safe, but now there are new threats that can follow her in both worlds. In order to find answers, Jessica must find ancient wisdom to protect herself and her family. While the first book was successful in setting up the science-fiction premise, the second book brings all of the excitement and adventure that was mildly missing from book one. This series could definitely be one to watch for. Only time will tell if the series will be as popular as one like The Mortal Instruments, but it has the potential.